What do the names Adam Lanza, James Holmes, Jared Lee Loughner, Elliott Rodger, Dylan Roof, and Chris Harper-Mercer have in common? Besides being among a growing number of mass murderers, they were all fanatic video gamers. I have been criticized in the past for making that connection, but I do not think that anyone can deny that there are some people who simply have a warped sense of what's real and what's not, thinking that real life is just like a video game. "You might want to target a girl's school which is safer because there are no beta males throwing themselves for their rescue." "I am so excited for this. If this comes true then thank you for my late birthday gift anon." "I suggest you enter a classroom and tell people that you will take them as hostages. Make everyone get in one corner and then open fire. Make sure that there is no way that someone can disarm you as it possible. I suggest you carry a knife on your belt as last resort if someone is holding your gun,"
"That score, ouch. Not even double digits on current reports." "THE MADMAN ACTUALLY DID IT"
How can people actually gloat over someone killing another person, or refer to the death count as a "score"? It is beyond my comprehension! Yet, the killers themselves leave us clues that the fantasy violence they become addicted to leads to their murderous actions. Harper-Mercer is reported to have said, "I've been waiting for years to do this" before he opened fire on his victims. Yet there are mothers who will tell me that they have let their sons play video games their entire lives and they know the difference between make-believe and reality... their sons would never act out a video game. Yet the afore-mentioned mass murderers are sons of other mothers, and they did just that. But why is it not conceivable that such violence in video games -- especially the first-person shooter variety -- could lead to a destabilization in a young person's mind? Whether you believe the devil takes advantage of the spiritual aspect of a kid's life or not, surely our society should be able to recognize that, overall, violent video games may not be suitable for children and their impressionable minds. And it's not only the pliable minds of children that we have to worry about. Recently, researchers at Ohio State University conducted a study and concluded that, "People who have a steady diet of playing these violent video games may come to see the world as a hostile and violent place." Brad Bushman, professor of communication and psychology at OSU, continues, "These results suggest there could be a cumulative effect in making video game players more aggressive and violent over the long term as well as over the short term." In other words, a steady diet of depersonalizing and dehumanizing violence just might numb the brain to a zombie-like state. In fact, Evan Ramsey, who snuck a shot gun into his high school and shot a student and the principal and wounded two others, was clearly deprived of his power of reasoning. He claims that a video game, Doom, distorted his version of reality: "I did not understand that if I pull out a gun and shoot you ... you're not getting back up. You shoot a guy in Doom, and he gets back up. You have got to shoot the things in Doom eight or nine times before it dies." Michael Carneal shot girls as they prayed in a prayer group. Carneal never moved his feet during his shootings, and never fired far to the left or right, but instead fired only once at each target that appeared, just as a player of video games maximizes his game score by shooting only once at each victim, in order to hit as many targets as possible. And I'm sure you remember Anders Behring Breivik, who shot 68 people dead at a youth camp of the Norwegian Labor party, and another nine in a bombing of government buildings. According to the judgment rendered against him, he liked playing violent games. He actually used the video game Call of Duty to train for his shooting massacre. By now, I'm sure you're getting the picture. Whether you want to give credit to Satan and his use of technology, or merely lay these horrendous crimes at the feet of unstable people; it should be clear that realistic and violent video games are doing something to our cognitive behavior. Too many people (primarily male) are developing negative patterns of thought about the world, and are unable to distinguish their fellow human beings from created video characters. And in turn, they have a distorted view of themselves in the role of avenger, victim, hero, or any other number of disturbed roles. This is not an indictment of all children who play video games, anymore than it is of all video games, themselves. However, when will we, as a society, realize that the most dangerous weapon a person yields is their mind? And yield is the key word. The way Satan gains control of a person's mind is when their mind is passive, idle, and not occupied with God's will. The more we allow our children's minds to be consumed with images of violence and killing (even if it is represented as coming from a moral authority), the more Satan will pull them into his web of deception and lies. And the more minds are corrupted with death and violence, the more dangerous society becomes. How much longer will we deny this truth? Psalm 11:5 "The Lord tests the righteous, but his soul hates the wicked and the one who loves violence." Recently, I stopped playing video games because of the spiritual aspect of them. 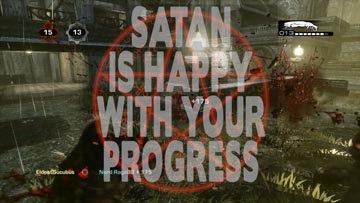 I noticed that many games are being made by satanists and new agers. This means to me, every time I would play certain games I would immediately get attacked. Believing in God makes a person a target. Light vs Darkness. You are absolutely right! I personally know of a recent case where a 7-year-old was influenced by the video game "Cut The Rope" and was led into some dark places, needing serious spiritual deliverance. These games are seductive and not as innocent as they seem.